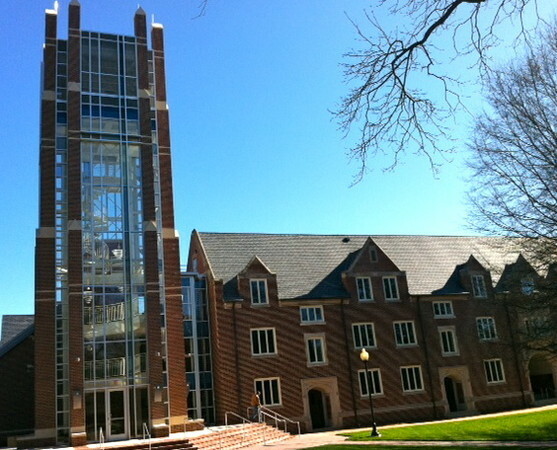 Earlier this year, the Columbia Theological Center opened its newest building on its campus in Decatur, Georgia. It is a building dedicated to Vernon Broyles, Jr. and is named after him as the Vernon S. Broyles, Jr. Leadership Center. The addition and renovation to the historic Simons Law Student Residence Hall were designed and executed by Lord Aeck Sargent Architecture firm. The existing building remains with only the windows, roofing, interior partitions and finishes renewed using sustainable materials and practices. It is linked to the new structure with two primary features, an eighty feet tall tower entrance and a double height arcade. The new brick and cast stone relates to the existing gothic structure, the new roofs are slate shingles made from recycled plastic and the glass is strategically placed for natural day-lighting and to control reflectance on interior work surfaces. Other sustainable materials included the use of recycled and local materials such as the linoleum and salvaged wood from the site as flooring. High efficiency plumbing to reduce water usage and high efficient refrigerant units for climate control were installed. Low VOC adhesives and coatings were used. The building is looking to receive LEED silver certification now that it is opened. They saved as many trees as possible as the site was reworked. They also incorporated the site drainage and rerouted it to an underground detention system that gradually releases the water as needed for landscaping and irrigation. A rain water harvesting system is also being used. It is crucial in modern design that all areas are considered in the design/renovation of existing and addition of new buildings. All factors are important such as, the landscape, land use, public spaces, interior/exterior open areas and the actual structures to be a truly sustainable environment. The Vernon S. Broyles, Jr. Leadership Center at the Columbia Theological Center is a very beautiful and sustainable example of what existing and new buildings can become together if all design aspects are considered and smart practices are implemented. « Make it Green: What Are the Greenest Choices of Wood for Building? Jennifer is originally from Colorado and has recently moved back from Michigan. She is finishing up her Master’s degree in Architecture. She is currently focusing on urban planning and sustainable design and hopes to gain employment at a design firm specializing in these areas. Jennifer also has writing experience serving as an editor for her school newspaper and college magazine. Jennifer has two cats named Prada and Dior-aptly named after her shoe obsession. You can follow Jennifer on twitter @jenshock81.